Head northeast this March, when nearly 80 percent of the world’s sandhill crane population descends on central Nebraska during their annual spring migration. Hailed as the second largest wildlife migration in North America, upward of 500,000 sandhill cranes speckle the Nebraska sky from late February to early April during their annual migration. It’s estimated that nearly 80 percent of the world’s entire population of sandhill cranes use a 75-mile stretch of the Platte River to “stage” before their long journey north to their breeding grounds in Canada and Alaska, creating quite a spectacle to behold. Lucky for Coloradans, nabbing a front row seat to one of nature’s most magnificent shows is only a short road trip or flight away. Whether you’re an avid birder, an amateur photographer, or just a fan of nature’s beauty, head to central Nebraska this spring to take in the breathtaking view. While cranes typically start arriving in the region in late February, the middle of March is really the best time to visit, when the migration is in full swing. The ideal time of day to see the birds is just after sunrise and during the golden hour before sunset. In the early evening, the swirling masses of blue-gray cranes take over the skies—landing in rivers, streams and fields to rest for the night. Just after the sun rises in the mornings, the birds fly away in droves, departing with just as much drama and energy as they arrived with. You can also catch huge clouds of cranes during the day as they pass overhead. At the migration’s March peak, the skies above Central Nebraska are painted blue with cranes. Visits to just about anywhere in the region will result in a crane spotting, but if you want an up-close view of the awe-inspiring spectacle, head to Grand Island, about a six-hour drive from Denver. Scientists have identified the world’s largest crane roost just outside of the city, making the area a bustling hub. A city of roughly 51,000 people, Grand Island was originally settled as a Union Pacific Railroad town, and is an excellent place to book lodging and fuel up between crane spotting adventures. When you want to get serious about crane viewing, make a trip to the Crane Trust, a nonprofit located just 20 minutes from Grand Island. Since 1978, the Crane Trust has fostered a safe and sustainably-minded place for sandhill cranes and people to coexist. 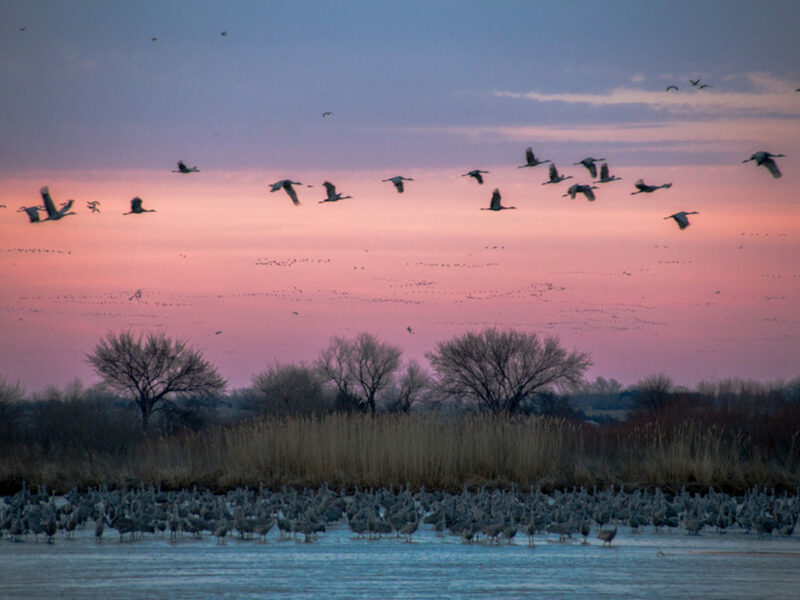 Visitors can check out the Crane Trust Nature and Visitor Center to learn more about the birds and their migratory patterns or explore 10 miles of trails that weave along the Platte River. The organization also offers various guided tours, as well as photography workshops, and hiking, biking, and kayak excursions on the Trust’s 4,500 acres. Want to get the best views of the migration? Spring for the VIP Crane Viewing Experience and enjoy an overnight stay at one of the Crane Trust’s Legacy Cottages, located just steps away from one of the largest crane roosts on the Platte River. About a half-hour drive southwest of the Crane Trust, just outside Kearney, is Rowe Sanctuary—1,300 acres of river habitat and wetlands, all managed by the National Audubon Society. The Sanctuary protects a section of the Platte River that is heavily trafficked by the cranes, and features an educational visitor center and multiple viewing blinds. During peak spring migration, the Sanctuary sees up to 70,000 cranes each night. Here, visitors can also book a guided photography experience ($75) or overnight crane photography experience ($250). Or sync your travels with the Audubon Nebraska Crane Festival in Kearney, March 22–25, which includes birding trips, environmental speakers, and other crane-inspired activities.